Is the perfect session for families wanting to experience an introduction into custom photography and needing only a few updated photos. Mini sessions are up to 30 minutes long and take place in studio or at a nearby park location at scheduled times throughout the year. Maximum of 4 people. Includes up to two hours of photography time for up to 5 immediate family members either in studio or on location. Additional family members are $25 each. Session includes an order and presentation appointment with 20-30 images for you to select from. Includes up to 3 hours of photography time and use of many props and backgrounds in the studio as well as natural light portraiture if time permits. Session includes an order and presentation appointment with up to 30 images to select from. The session fee covers my time and talent, session consultations, time spent setting up, and editing. I reserve only one session a day in order to give a truly custom and personalized experience to my clients. The session fee is payable within 48 hours of booking your session in order to secure your choosen date. Once I have received your payment the session date is reserved for you! For your convenience, payment may be made through my website at the Sweet Pea Store. The fee is not refundable if you cancel however you may reschedule for another date. Prints and digital files are purchased separately, during your ordering session, either from the al a carte menu or from a portrait collection. Bundled sessions which include the session plus your choice of either a print collection or a digital collection are also available and offer a substantial savings to families. Bundled sessions are purchased before your session date and do not include an ordering session. Includes session plus 5x7 gift prints. Please contact us for a detailed price list or to set up an appointment where we can show you examples of our work and discuss pricing options. Popular products include fine art canvas prints and gallery wraps as well as custom designed birth announcements, holiday cards, invitations, leather albums, coffee table books, collages/storyboards,custom guest books, custom keepsake boxes, and professional framing. SESSIONS ARE SCHEDULED FROM JANUARY 15TH TO DECEMBER 6th. 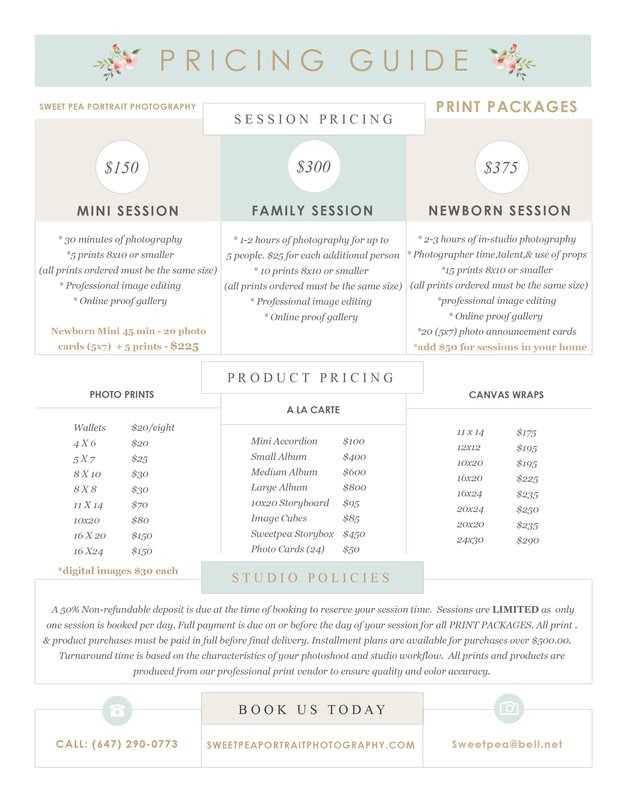 Having no sessions after December 6th allows receipt of portrait orders in time for the holidays. To view available dates for booking please see "session availability" on the website. Sessions may take place in studio or on location. Location sessions take place at your home or other favourite place and can be quite casual...or not! 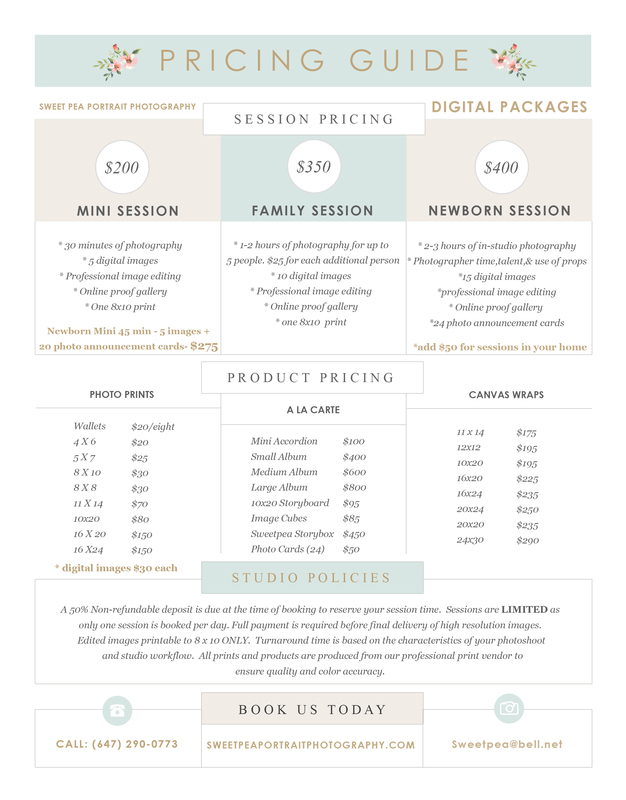 There is an additional fee for on location Newborn Sessions. Feel free to email Sandra for her suggestions on locations, clothing etc.